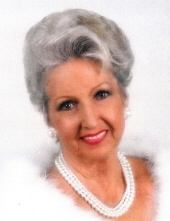 Joanne Ford Wade, 89, of Peachtree City passed away February 9, 2019. She was born in Atlanta on October 7, 1929 to the late Weyman William and Sally Mae Ford. She was a beloved wife, mother, and grandmother who will be missed by all who knew her. Joanne was preceded in death by her son, Richard Clayton Wade and her parents. She is survived by her husband of 72 years, Jesse A. Wade; sons, Michael (Denise) Wade, Robert (Brenda) Wade, and Aden (Clare) Wade; six grandchildren and seven great-grandchildren. A graveside service will be held at 12:30 PM on Tuesday, February 12, 2019 at Camp Memorial Park, Fayetteville with Dr. J. W. Wallis officiating. The family will receive friends from 11:00 AM-12:00 PM on Tuesday prior to the service at Mowell Funeral Home, Fayetteville. To send flowers or a remembrance gift to the family of Joanne Ford Wade, please visit our Tribute Store. "Email Address" would like to share the life celebration of Joanne Ford Wade. Click on the "link" to go to share a favorite memory or leave a condolence message for the family.